It’s a couple of months since I made a bookmash, so here’s a new one. Thanks to the authors: Octavia Butler, Jane Austen, Günter Grass, F. H. George, Erik Davis, James Vance Marshall, Alice Taylor, Arika Okrent. More in the bookmash archive. From an idea by Nina Katchadourian. Alice Taylor’s Quench the Lamp is a warm and funny memoir of her childhood in rural Cork in the 1940s, full of anecdotes and observations on farm activities, family dramas, eccentric neighbours, and Irish life before and after electrification. A chapter on thrift and the “art of making do” shows how objects’ versatility was engineered and enhanced. Pot lids warmed beds, goose wings dusted cobwebs, turf dust was deployed when the cat did “what he must where he shouldn’t”. Bags and boxes were strategically repurposed once emptied of their original cargo. Our newspaper, the Cork Examiner, was a multi-purpose item. It cleaned and polished windows and it covered bare timber floors before the first lino or tarpaulin went down, thus providing underlay and insulation. Placed in layers on top of wire bed-springs, it eased the wear on the horsehair mattress; cut into the right shape, it became insoles in heavy leather boots and shoes and, later, in wellingtons when they became part of our lives. Even though it could never be described as baby soft, it was the forerunner of the multi-million-pound industry that subsequently provided soft solutions in the toilet-paper business. Rolled into balls it was a firelight, its effectiveness improved by a sprinkling of paraffin oil. Ned [a local shop owner] shaped it into funnels and filled it with sweets to make a tóimhsín, as he called it. At home it lined drawers and was considered mothproof and, when nothing else was available, it was used as a dustpan. One of our more industrious neighbours regularly covered her potato stalks with newspaper at night and this protected them from frost. Taylor says those who excelled in the frugal art ran the risk of being considered thrifty to a fault – it would be said of them that they “could live under a hen”. Or you might say someone “could live in your ear and rent out the other one without you knowing it”. A tóimhsín or tomhaisín /’t̪oːʃiːn/, by the way, is Irish for a small measure or amount, or in this case a cone-shaped paper bag or poke, often used for holding sweets. It comes from tomhais “measure, weigh”, and is sometimes anglicised as tosheen, to-sheen, or toisheen. Booking passage in the modern idiom. Thanks to the authors and editors: Alice Taylor, Daniel Boorstin, Riane Eisler, Sinéad Gleeson, Thomas Lynch, and Leo Hamalian & Arthur Zeiger; and to Nina Katchadourian for the idea. Since my last bookmash, the game has continued to spread – most notably to the great US public radio show on words and language A Way with Words (full episode here), which read out a few and encouraged listeners to compile their own. 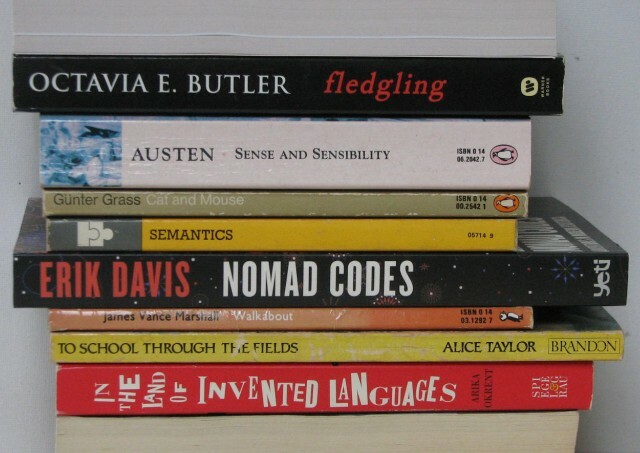 I haven’t read all the books in this stack, so feel free to recommend. 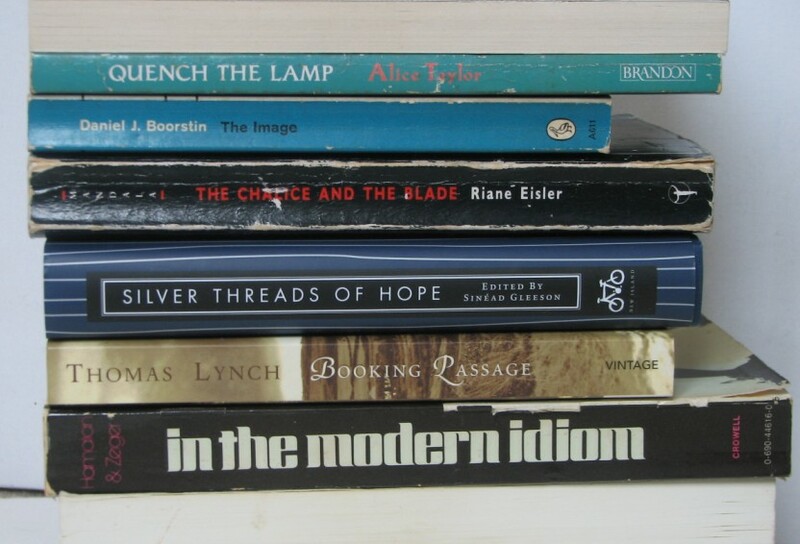 Some of you might know Silver Threads of Hope, a new anthology of Irish short stories in aid of mental health charity Console; it appeared in an older Sentence first post on turn-taking in conversation. My previous bookmashes are here. Join in, if you like!